08 Nov Trainer Spotlight!!! Amanda Aiello from Tigerfit is rocking classes & more! Its that time again folks, when we share our excitement about one of our favorite new coach/trainers! We love taking classes of all types and keeping our bodies guessing, and today I want to talk about someone who is pretty new to the fitness coaching world. Amanda Aiello from Tigerfit wears many hats in her role as Assistant Manager, and her most recent one is as an instructor for multiple class formats. Ill let you dive into the Q&A below, and then I’ll share my experience as a student in her classes. 1. Please introduce yourself: Name, Title, and favorite class. My name is Amanda Aiello I am the Studio assistant manager and trainer and my favorite class would have to be Ride. 2. How long have you been a part of the fitness industry/coaching? I have only been a part of the fitness industry for about 2.5 months but before this I was a lightweight rower at UW-Madison. Fitness and wellness has always been a part of my life. 3. How did you end up in your position? It’s not what ya know it’s who ya know. My college roommate and best friend worked at TIGERFIT over the summer, she told me they were looking to hire someone full time. I interviewed for the position and here I am. 4. It is obvious in your class that you love training your clients, what makes you passionate about what you do? 5. What is your favorite class to teach? Why? Ridecore or any ride class really. I like being loud and blasting my music and the adrenaline that you get when the pressures on. I also enjoy the variety that ridecore gives you with the half bike half core breakdown. 7. What is your favorite post workout indulgence? Bundt cakes duh. or anything sweet. 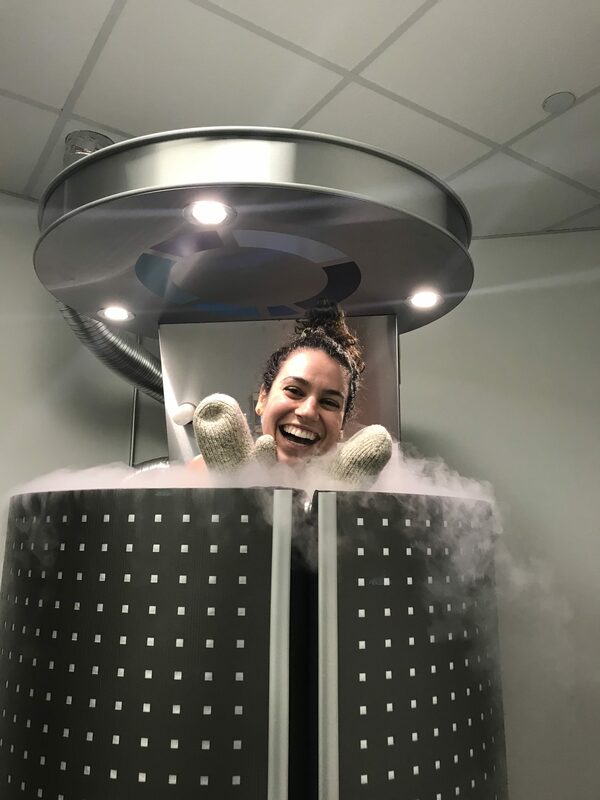 As we opened our new Minnetonka Halo Cryotherapy location inside of Tigerfit, I have had the opportunity to take so many amazing classes with the whole Tigerfit crew of coaches. They are all so well educated and motivating, it is a great place for people of all fitness levels to come in and improve. With Amanda being the most recent addition to the coaching staff, I have been able to see her progression and training with Stacie Clark (whose classes are AMAZING) to get her to a point where she could train clients one on one and in class format and get them to push themselves beyond their own limitations. I have taken a number of her classes (RideCore 45, Power Hour, Ride60) and always get a great workout where I am dripping sweat and feeling amazing about what I just accomplished. I was always terrified of the Ride class because bikes seem so difficult, but by working with Stacie and Amanda to log more miles on the bike I can definitely say I like it now and cant wait for more! Amanda brings a similar athletic background to mine, being a captain of a team sport and being comfortable leading other athletes shines through for her. She was a two time captain of The University of Wisconsin Rowing team, and has been doing a few personal training sessions with rowing athletes looking to continue college careers or prepare for their season. Her personality and energy draws you in, and earns your trust so that she can motivate you beyond your comfort zone in class. You gotta come in and take her class. Maybe you will see me on the bike next to you! Special holiday hours for Thanksgiving and Christmas will be posted via Facebook and Instagram, so keep an eye out for when you can come in and get your Cryo! Black Friday? Yes Please! Follow us on Instagram and Facebook for deals and announcements!